A wired or automated home, simply put, is a house whose systems are controlled by computer. Integrating home systems provides security, peace of mind and convenience, and the applications to simplify life are nearly endless. With the cost of embedded microchips for electronic devices falling, the super-space-age homes once found only in Woody Allen movies are now becoming common in the American suburbs. "The industry is about to change," says Ken Kerr, president of the Home Automation Association, "because IBM, AMP, Lucent Technologies, and Microsoft are about to jump into this, and they have big advertising budgets." The automated-home industry currently generates about $2 billion in sales annually, jumping to an estimated $27 billion by 2005. A wired home has numerous security/protection applications, including the use of intelligent lighting controls, monitoring systems and motion detectors. Security systems can be linked with PCs, intercoms, HVAC controls and lighting systems to give the homeowner optimum control and flexibility. Wired homes can be equipped to accept all entertainment systems/distribution services such as direct-broadcast satellite, DVD, cable, music, etc.). Homeowners have maximum freedom and flexibility to direct audio and video services on demand to all or one outlet in the home, from the bedroom to the home theater. Advanced wiring systems allow consumers to plug in personal computers anywhere in the home to access Internet services, as well as send and receive e-mail and faxes. Multiple computers, printers, fax machines and other devices can be connected to create a cost-effective and convenient home-area network, allowing for sharing of files, printers, games, etc. Single phone lines can share Internet access for multiple, simultaneous users without tying up phone lines. Families can enjoy high-speed Internet access and multiple e-mail accounts while maintaining a single access/service provider. With an automated house, professionals can work at home as conveniently as if they were at the office. Home offices can accommodate multiple communication technologies, so the computer, fax machine, modem and telephone can function simultaneously while providing the efficiency of the latest in high-speed Internet access. Access controls: The ability to gain access to your home, including driveway gates, security keypads, electronic locks, etc. Audio/video control systems: Home theater, audio and video systems. Communications: Telephone systems and intercoms allowing internal and external communications. Control devices and sensors: Modules, devices, and sensors that activate a light, appliance or system. Home automation protocols: Also known as home automation standards, these serve as the communication infrastructure for your home automation system, allowing different products and subsystems in the home to communicate with one another. Home theater/satellites: For the ultimate in home entertainment, these products bring you very large screen television, top-notch sound systems, and satellite dish technology providing access to more TV channels than cable or broadcast usually offer. HVAC and energy management: Heating, ventilation and air conditioning systems lend themselves well to automation, providing the homeowner with maximum comfort along with maximum control over the timing and energy demands of temperature and ventilation control. Lighting devices and sensors: These products allow you to pre-set (or detect motion or light) and activate the internal and external lights of your home to turn on, off, dim, or brighten, at whatever times you wish. Motorized devices: These open and close things like garage doors or blinds at just the right times. Security systems: From alarms to child tracking devices, these products help make your home safer. Utility-based services: Services provided by utility companies to monitor and control energy management requirements in your home. 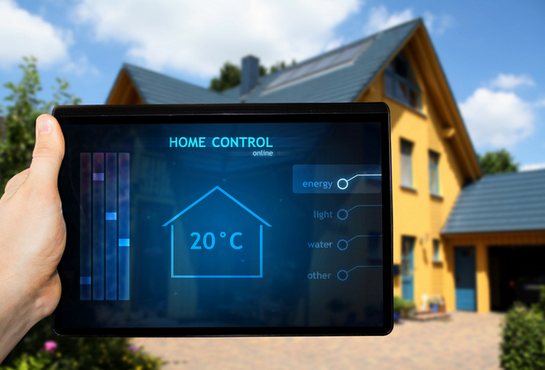 Whole-house control systems: When you want to be able to control and automate many systems in your home, go for a whole house control system. Windows and covering controls: These pull the blinds...or open them up...without your lifting a hand. Wire/wiring and cable systems: Structured-cabling systems are the information superhighways of your home; you need the right kinds of wiring to make the most of communications, the Internet, and audio/video.